An innovative storyteller, Shaaz is a Visual Designer who uses multiple methods, mediums and materials in his process of constructing a visual narrative, be it on a film screen or public spaces. His Design methodology in construction Art or creating content is what gives him his unique language and space. 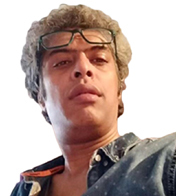 He has studied Communication Design with a specialization in Animation Film Design from National Institute of Design (NID), Ahmedabad India and is the Founder Director of Mud n Water – a Communication Design Studio in Gurgaon, India producing Ad Films, Animations, Short films, Urban Art, Documentaries, etc. He was associated with the Sesame Street Workshop for 3 years as an Animation Director and has worked extensively in the Indian Television and Film Industry. He won the Promax Gold (Singapore) for his Channel V Id’s, and several other National level awards for his Short Film ‘Talking Walls’, including the Mumbai International Film Festival (MIFF). He has been associated with various institutes as a visiting faculty including NID, Ahmedabad (Experimental Animation) and IIT (IDC) Mumbai. He has also been heading the Interview panel at the MCRC Jamia, New Delhi for the last couple of Years. He has a passion for performing live Paint Animation and is also associated with various theatre groups. His recent body of work has moved out of the table and come into the Spaces, where he is exploring art animation in the Installation space. He was recently invited By the Serendipity Arts Trust to do an Animated Art Installation in Goa. His recent body of work include Cafes Hospitals, College, metro stations and the recently concluded Anatomy Museum at MAMC, New Delhi. His current passion is the exploration of One frame Animated Films, a unique new genre in visual and motion Design – Chitrachal.